HAPPY EARTH DAY! My whole happy hour emphasis these days is on healthy cocktails. Whenever possible I try to use fresh and organic produce, healthier* sweeteners, garden grown herbal elements and Earth friendly ingredients. 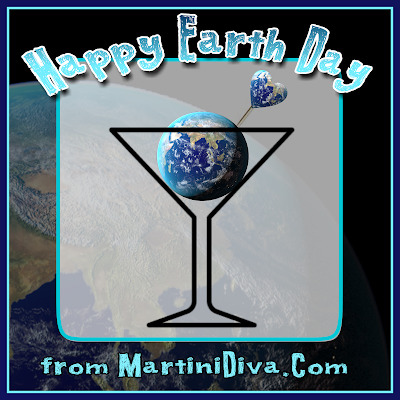 For Earth Day I have listed a few of my favorites below, trying to cover a number of flavors and spirits, but they only cover a small percentage of the original cocktails I've created to be planet and people healthy that are available on my site here. Feel free to check out my cocktail lists to the left and use my search bar for your favorite spirits and flavors for more recipes. How to Drink Earth Friendly at Happy Hour Spirits themselves are basically Earth friendly because fermentation is a natural process, but low cost liquors tend to use inferior grains and ingredients so stay in the mid to higher range priced brands. There are also numerous commercial spirit brands out there whose products are intentionally organic and planet friendly. As for flavored liqueurs and spirits, you can buy any neutral organic spirit and infuse them yourself with your own fresh organic herbs, fruits and vegetables. Make your own Homemade Liqueurs with organic produce, start a small organic herb garden, visit your local farmer's markets for organically grown produce. You can use local honeys for sweeteners and even create your own organic fruit based simple syrups and mixers as well. Even tonic water and grenadine can be made Earth friendly. Make your own Homemade Pomegranate Syrup, dump those chemical, GMO laden bottled cherries for clean and delicious Homemade Maraschino or Bourbon Cherries. * Yes, I do occasionally use sugar in my recipes, sweeteners are one of the vital elements to a balanced cocktail and sometimes there is no alternative to sugar itself, BUT sugar is NOT by nature unhealthy, it's the AMOUNT of sugar and corn syrup, ad nauseum, that is added and/or hidden in processed food and drink that is the culprit to a healthy diet. Turbinado and Demerara are raw sugars and are good alternatives to cane sugars. Remember, balance is the key, to a healthy life and a healthy Earth.